Should Investors Be Worried About Capital One’s Aggressive Auto Lending Push? Is Discover’s Below-Average Growth In U.S. Card Purchase Volumes A Cause For Concern? Should Investors Be Worried About Capital One’s Private Label Card Losses? What’s Behind The Recent Fall In Capital One’s Share Price? After having crossed the $1 trillion mark a year ago, the U.S. card industry has grown steadily over recent quarters after nudging lower over the seasonally weak first quarter to reach $1.04-trillion in size by the end of Q3 2018. 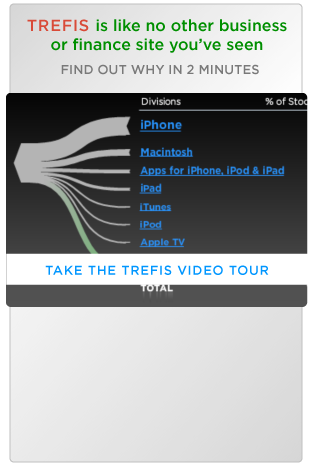 This represents an increase of just under 4% over the last twelve months. While the overall shift towards cashless payment options remains the primary factor behind swelling card balances, upbeat consumer sentiments have also played a role in boosting card usage over the last few months. As detailed in the table below, most of the ten largest U.S. card lenders benefited from this trend, with all of them except for Barclays witnessing an increase in their card portfolio since Q3 2017. Also, all but three of them (Barclays, Capital One and Bank of America) recorded faster growth in their card balances compared to the industry. Synchrony and American Express stand out among these lenders with a year-on-year growth figure of around 14% – more than three times the overall industry. This can be primarily attributed to their card-focused business models. However, Capital One’s card balances have grown at a much slower rate compared to its peers despite its focus on card lending because of its high card charge-off rate over late 2017 and early 2018. As we detail in our interactive valuation dashboard for Capital One, this had a notable impact on its card loan growth. Figures for most card issuers at the end of Q3 2017 and Q3 2018 are taken from their quarterly SEC filings. For some issuers that don’t detail their U.S. card loan balances separately, we have used the latest call report as filed with the FDIC here. 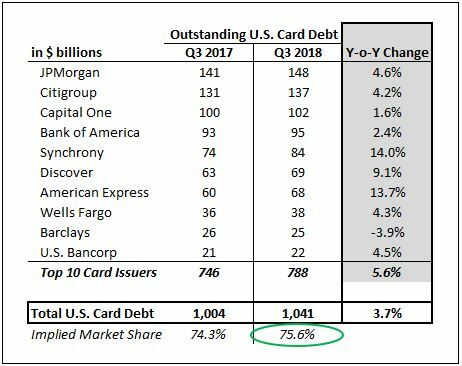 It should be noted that the figures for American Express and Discover here capture the outstanding balances for cards they issued directly, not those that are issued for their payment networks by other card lenders. The total card debt figure is as compiled by the Federal Reserve here. JPMorgan figures at the top of the list, with a market share of a little more than 14%. The diversified banking giant has done well over the years to leverage its strong retail banking presence to report growth across card segments. Notably, the five largest U.S. card issuers account for almost 55% of all outstanding card balances in the country, while the combined market share of the top-10 players is well over 75% – highlighting the concentrated nature of the industry. With the holiday season expected to result in a sharp increase in card spending for the fourth quarter, these card issuers should end the year on a strong note with their combined market share likely reaching 76%. Visualize Related Companies: American Express Company , Bank of America , Barclays , Capital One , Citigroup , Discover , JPMorgan Chase , U.S. Bancorp , Wells Fargo & Co.